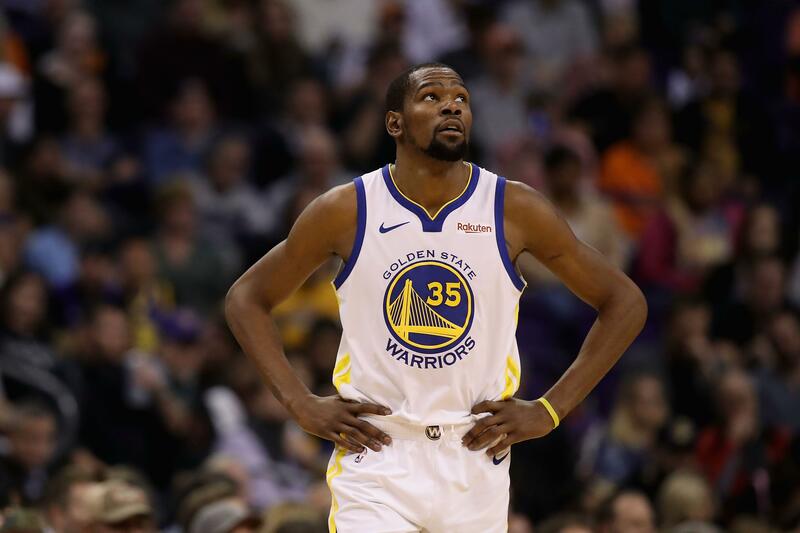 Much of the talk regarding the Golden State Warriors in 2019 has focused on Kevin Durant’s impending free agency. Despite rumors that the two-time NBA Finals MVP is likely headed elsewhere this summer—specifically, to the New York Knicks—and Durant’s angry reaction to questions about his future, the defending champions have not been negatively affected on the court. Durant led the Warriors with 39 points Sunday in a 120-118 win over the Miami Heat. The victory gave Golden State 15 wins in their last 16 games and put them three games ahead of the Denver Nuggets for the No.1 seed in the Western Conference. The Milwaukee Bucks are one game ahead of the Warriors for the NBA’s best record. There was a time this season when it looked like Durant’s impending free agency might keep Golden State from winning a third straight title. When Draymond Green was suspended for daring Durant to leave the Warriors during an in-game altercation, it came during a stretch of eight losses in 13 games. But Golden State quickly rebounded once players like Green and Stephen Curry recovered from injuries. Curry is nearly playing as well as he did three years ago when he became the league’s first-ever unanimous MVP. The point guard is third in the NBA with 28.6 points per game, shooting 49.2 percent from the field and making 5.1 threes per game on 44.9 percent shooting from behind the arc. Durant is fifth in the NBA with 27.5 points per game. All of the drama has overshadowed what’s been a terrific season for the superstar, who is averaging a career-high 5.9 assists per game. The addition of DeMarcus Cousins might have truly made the Warriors unbeatable. The center was expected to land a max contract last summer before he ruptured his Achilles. Signing with Golden State on a one-year deal, Cousins sat for the first half of the season before returning just a few weeks ago. Maybe Cousins isn’t the same player that was an automatic double-double for several seasons but he’s enough of an upgrade that the team that was already the odds-on favorites to win the title has performed even better. The Warriors have gone 9-1 since Cousins made his season debut, only losing when Klay Thompson was sidelined with an illness. In just 22.9 minutes per game, Cousins is posting averages of 14.1 points, 6.5 rebounds, 3.6 assists and 1.2 blocks. Golden State needed seven games to beat the Houston Rockets in last year’s conference finals. There doesn’t appear to be that same kind of threat in the West this season, and the Warriors are well on their way to securing home-court advantage until at least the NBA Finals.